Curry is a favorite dish in Thai restaurants throughout the world and for good reason. Based on a delicious paste of fresh and dried herbs and spices, curry is unique and unlike any dish in Western cuisine. The endless combinations and fresh taste make curry a popular dish. But what exactly is curry? Favored throughout Asia in many different forms, curry can be defined as a savory, stew-like dish flavored with herbs and/or spices. Curry is considered to be native to India, Pakistan, Sri Lanka and South East Asia. This method of cooking was brought to South East Asia by Indian immigrants over the past several centuries. In Thailand, curry is usually a soupy dish consisting of coconut milk or water, curry paste and meat. Thai curries tend to be more soup-like compared to their thicker Indian cousins. Curries are the richest dish of Thai cuisine, being based on spicy herb and spice pastes, i.e. curry pastes. There are dozens of different types of curries in Thailand varying by the use of various types of curry pastes, the addition of coconut or water and different combinations of meats, herbs, vegetables and fruits. Curry is a staple dish of Thailand and in many Thai homes it is eaten on a daily basis. Using ingredients commonly found growing around the home and very little meat, curry is an economical and healthy part of the Thai diet. High in vitamins and rich in protein, it is easily digested when eaten with rice as part of a Thai meal. In Thailand there are basically two broad categories of curry: water-based and coconut milk-based. The most typical water-based curry is sour curry (gaeng sohm plah) often prepared with fish. Typically the sourness comes from tamarind or other types of sour fruits. Jungle curry (gaeng pah) is another delicious water-based vegetable curry cooked with or without meat, which is usually very spicy. The spiciest curries in Thailand in general are the water-based curries, as there is no coconut fat to alleviate the heat. Thai coconut-based curries are numerous and more well known in the West with red, green, yellow, panang and masamam being the most well known curries. In Thailand these curries are known as gaeng phet (red), gaeng kiow wahn (green curry), gaeng leuang (yellow), gaeng phanaeng (panang) and gaeng massaman (masamam). The most popular curry in Thailand is either gaeng phet or gaeng kiow wahn depending on which region of the country you are in. Another way to categorize curry, is by the curry pastes used to make the gaeng. Green curry is the only type of Thai curry paste made with fresh Thai chilies. All other types of curry paste are made up of dried Thai chilies. See Curry by Color for the more typical way to categorize types of Thai curry like red, green. yellow, panang, masaman and more. See Regional Types of Curry for more details about the various curry dishes from different parts of Thailand. Curry is called gaeng phet in Thai. In Thai gaeng means liquid and refers to both soups and curries and phet means hot in the incendiary sense. When searching for a Thai curry recipe, note that often times the water-based curries are categorized with soups, because not all gaeng are spicy curries. Gaeng also encompasses mild flavored soups called gaeng joot i.e. clear Thai soups. The various gaeng phet dishes are based on blends of fresh and dried herbs and popularly known as curry paste, or in Thai kreung gaeng or nam prik gaeng. A “marvelous aromatic mixture of freshly ground herbs and spices” Thai curry paste is not a dry spice powder blend as used in Northern Indian curries, but rather a wet paste made up of mainly fresh herbs and spices (Jennifer Brennan, The Original Thai Cookbook, © 1981). In fact "dry aromatic spices, prominent in Indian curries are used sparingly in Thai cuisine" (Kasma Loha-unchit, Dancing Shrimp, © 2000). Curry pastes are the basis of curries throughout South East Asia. Thai, Indonesian, Malay, Cambodian and Vietnamese curry pastes are intense, thick moist blends of aromatic herbal ingredients and spices. Often times a ready-made curry powder is blended into the wet ingredients in Malay and Vietnamese curries, unlike Thai pastes. The key ingredients in the majority of Thai curry pastes are mostly wet and fragrant: fresh chilies, lemon grass, galangal, garlic, shallot, kaffir lime, cilantro roots, and shrimp paste (kapee). These herbs and spices are appreciated not only for their taste, but also for their medicinal qualities (yah samun phrai). Curry paste not only forms the basis of curry dishes in Thailand but also can be used in several other dishes, such as stir-fries. “Curry pastes form the basis of almost all Thai dishes – the exceptions are soups and [vegetable] stir-fries” (Vatcharin Bhumichitr, The Big Book of Thai Curries, © 2007). See Comparing Curries below for a comparison of Indian curries to Thai curries. By varying the few herbs and spices making up the curry paste, the palette of flavors of the various pastes is amazing. As cooking instructor and cookbook author Kasma Loha-unchit notes, “After you have tried out recipes for several different kinds of curry pastes you will notice that many of the same ingredients are used, yet the resulting pastes are far from similar, varying the proportions of ingredients, prepping them differently (e.g. roasting or not roasting beforehand [spices, shrimp paste, garlic, etc]), deleting an ingredient, adding a new one or introducing a new twist somewhere in the process. All of these variations can produce entirely different curries unlike anything a comparison of ingredients may suggest” (Kasma Loha-unchit, It Rains Fishes, Legends, Traditions and the Joys of Thai Cooking © 1995). The texture of the different Thai curry pastes also varies: “some kreung gaeng (curry pastes) run to the consistency of fresh clay, while others are as soft as cornmeal dough.” (Joe Cummings, Lonely Planet World Food Thailand, © 2000). With all this variety it's no	wonder	that curry is part of the daily repast for many Thai people! The curry dishes of Thailand have no direct equivalent in Western food, making it hard to translate exactly how to serve and eat curry. Curries are eaten spooned over plain steamed jasmine rice or kanom jeen (round rice noodles). This helps to cut the heat and the intensity of the flavors. To eat curry as we eat normally eat soup in the West is inappropriate because curries are packed full of intense spices, herbs and hot chilies. Diners normally share a bowl of curry which is accompanied by dishes with mild, salty, bitter and sweet tastes. Once cooked, the curry is removed from the heat and usually allowed to cool while the other dishes of the meal are prepared. Curry can be served at room temperature over hot steaming rice. Or it can be served hot over room temperature rice, which helps to alleviate the heat. More things to consider when serving a curry is to plan what dishes you pair your curry with - in Thailand the cooling factors are bland and salty - an example of a bland dish being gaeng joot (mild soup) and a salty dish is often fried salty fish. See Some Like it Hot for more suggestions about serving a spicy curry dish. Breaking into a sweat while eating curry is, for many, highly desirable. It is a sort of addiction once you eat curries on a daily basis for about a month. Gradually your tolerance for spicy food increases to an incredible level you never dreamed possible! Reputedly there are many health benefits from eating chili peppers, including high Vitamin C content and increased metabolism rate. If you like milder curry, simply omit the fresh whole chiles and/or add less curry paste. Another excellent hint is to first cook the rice and allow it to cool to room temperature, making it easier to eat spicy foods. The plain rice also offsets the spiciness of the curry. 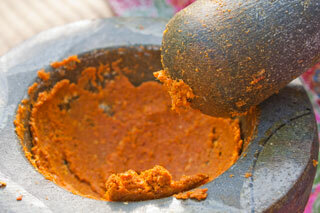 Many Westerners hear that a certain type of curry paste or curry is the spiciest curry amongst the various types, but this depends on many factors such as how the paste is prepared - i.e. a homemade paste prepared with fresh chilies can be very hot (but even that depends on the chilies themselves and how many used). Then when cooking the curry, the heat level depends on the ratio of curry paste to coconut milk (including how thick or rich the coconut milk), added vegetables (such as sweet potato or pumpkin, which adds sweetness and thereby alleviates heat) and finally the balancing of flavors with the addition of sugar (usually palm sugar) and added salt (sea salt or fish sauce). Also consider which dishes to pair the curry with - in Thailand the cooling factors are bland, bitter and salty, so serve with a bland gaeng joot (mild soup), fried green vegetables (slightly bitter) and fried salty fish over room temperature jasmine rice. Most Thai meals aim towards a balance of the five flavors (sweet, salty, spicy, bland and bitter)with spicy being just one in a palette of tastes. See Serving Curry above for more details. Thai curry is not the same as Indian curry. Thais cook their curry dishes for a much shorter time and use more fresh herbs and garlic and fewer dry spices then in Indian curry. Thai curries in general also tend to be more soupy then Indian curries. The only two curry dishes in Thailand that are based mainly on dried herbs and spices, rather then fresh ones, are Massaman and Panang curry. "A few Thai curries do resemble the Indian version, in which case the name kari is used, but the more usual term in Thailand is gaeng phet" (Vatcharin Bhumichitr, The Big Book of Thai Curries, © 2007). Like Masala (spice mix) used to prepare Indian curries, the following four spices are included in the majority of Thai curry pastes: hot chili peppers, cumin seeds, coriander seeds, and turmeric. In India other dried spices are added such as fenugreek, black pepper, asafetida, allspice, cardamom, cinnamon and nutmeg. But in Thailand fresh wet herbs are predominant including lemon grass, galangal, kaffir lime (leaf or peel) and grachai. In both Indian and Thai cuisine fresh herbs like garlic are combined with dried spices to make the various curry pastes. In India this style is more prevalent in the southern part of the country, hence Thai curry has more in common with the curries of Southern India, where fresh spices and "other ingredients [are] ground with water, lime juice, vinegar or coconut milk to make a wet masala or paste" (Jennifer Brennan, Cuisines of Asia, © 1989). In Thailand, curry paste does not normally include oil, water, lime or vinegar (unlike chili pastes which are used for other dishes). These elements can be added to the curry dish itself but are not blended into the curry paste. A typical basic curry paste in Thailand would consist of dried red chilies, cumin seeds, coriander seeds, lemon grass, garlic, coarse sea salt and shrimp paste. See Curry by Country for more details about the different types of curry dishes from around the world, including Vietnam, Cambodia, Sri Lanka, Laos, Burma and India. Do You Want to Make Delicious Thai Curry? We stock a selection of popular brands of Fresh Curry Paste & Prepared Curry Paste as well as many other essential ingredients and Asian kitchenware in our fully stocked online Thai Food Store.